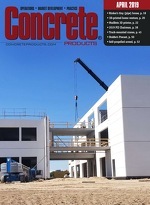 Batch controls and concrete plant automation developer Marcotte Systems has entered a partnership with fleet technology and Internet of Things (IoT) device specialist Coretex, whose 360 solution encompasses a complete set of sensors specifically designed for ready mixed delivery and quality control—drum rotation, water-added measurement and precise integrated statusing among them. The integrated Marcotte and Coretex system is on field trial and scheduled for early-2019 launch. “By combining Coretex’s IoT platform with advanced tracking, integrated cameras, engine management and service data with [our] comprehensive process control and automation, dispatching software and batching systems, we have redefined the meaning of an end-to-end construction solution,” says Marcotte Systems Global Vice President of Sales Alexandre Leblond. “The alliance will provide our mutual customers with efficiencies and consistent product quality that has never been seen before in the ready-mix industry,” adds Coretex Executive Vice President, North America Dean Marris. Marcotte Systems’ namesake Control platform adjusts the required quantity of each mix constituent during batch execution, while preserving key ratios and volumetric yield. All parameters such as local material properties, density, absorption, granularity, moisture and temperature are used to smart-balance mixes.